It’s always great to instill your child with virtuous values from the get-go. That means you need to teach her to clean her room, eat her vegetables and always do her homework on time. You also may need to teach her how to battle against the forces of evil, should a super villain like Doomsday or Ares come to cause trouble in your neighborhood! You’d better start training her ASAP. The first thing you’ll need is a proper outfit for your little girl to wear while fighting the bad guys! After all, she might look a little silly trying to fight against super villains while wearing her nice school clothes. 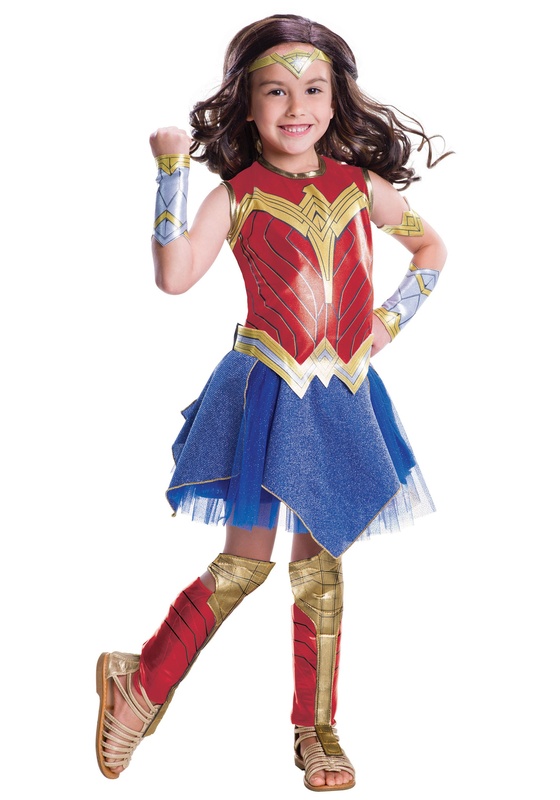 This girl’s Wonder Woman costume is inspired by the outfit worn by Gal Gadot in the Justice League movie, so your little one will look ready for anything. It comes with a red dress with a blue skirt bottom. The top has plenty of printed details to make it look like Amazonian armor and it even has the gold Wonder Woman symbol designed into the front. Boot covers and wrist gauntlets are also included to add that finishing touch to your girl’s super hero style. Of course, don’t stop there! You’ll want to teach her some Amazonian swords skills and how to lasso the bad guys with her golden lasso of truth, so be sure to pick up a few of our weapon accessories to get the complete look for your young Justice League hero in training.